San Onofre Senior Resident Inspector Greg Warnick (left) and Resident Inspector John Reynoso at the Dana Point Safety Expo. This past weekend, NRC set up information booths at two events that each drew several thousand attendees. On Thursday, Aug. 23, the resident inspectors from the Diablo Canyon nuclear plant joined two public affairs officers as well as the Director of the Office of Public Affairs at San Luis Obispo Market Night. Every Thursday night, city officials close off the downtown area in San Luis Obispo and set up a street fair. NRC staffers interacted with about 75 individuals, answering questions on a wide range of issues ranging from seismic safety to nuclear waste storage and transportation. This is the third year that NRC has attended the SLO Market Nights, setting up a booth in order to provide brochures about agency programs and functions as well as answer questions from members of the community. On Saturday, Aug. 25, we did the same thing at a safety expo in Dana Point, Calif., where we appeared side by side with representatives from numerous Orange County public safety organizations. 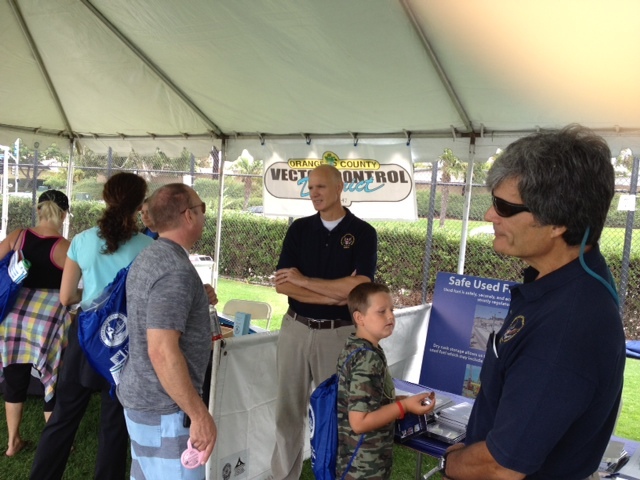 We set up a booth where we were joined by the resident inspectors from San Onofre. There, about 200 individuals came to the NRC booth where NRC staffers answered questions, distributed literature and shared our safety message. We got lots of questions about steam generator issues at the plant and brought with us large posters that we used to describe the nature of the problems and NRC’s role in ensuring public safety. These appearances are part of an ongoing effort in Region IV to expand our public outreach initiatives and develop new ways of communicating the agency’s mission and public safety goals with the public.